In 'Gmorning, Gnight!' Jonny Sun And Lin-Manuel Miranda Craft A Peppy Pick-Me-Up What if, instead of reaching compulsively for your phone for comfort and distraction, you could pick up a book? That's what Lin-Manuel Miranda and illustrator Jonny Sun aimed for in their new book. "I was aware of him much earlier than he was aware of me," Sun says. "But eventually I think we just started realizing that we were just kind of floating in the same space, and that's how we started to get to know each other." That space was a happy, encouraging space on Twitter. Miranda wanted to compile a book of his daily tweets — things like "Good morning. Good gracious. Your smile is contagious," and "Good night then. Good gracious. You're one for the ages." Sun ended up tweeting at Miranda about that — he had ideas for how the book could come together. The result is their new book, Gmorning, Gnight! 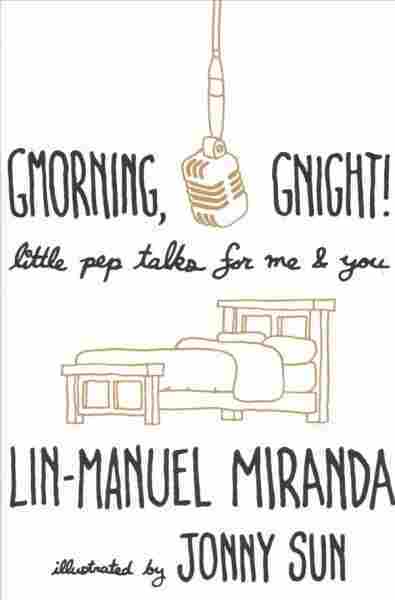 Little Pep Talks For Me & You, with Miranda's words and Sun's illustrations. "The Twitter feed, and kind of social media in general is meant to be ephemeral," Sun says. "And I think when it moves from online to offline, it becomes more of like this capsule of something. And it's meant to be visited, and it's meant to be a little more timeless." The real joy of it was really working with Lin to make sure that the illustrations were reflective of him. We spent some time going through each of the tweets, and he kind of gave me like the director's commentary of each kind of passage, and told me here's how he was feeling this day, here's what he was thinking of. And the joy for me was taking all of that stuff and trying to fit it into the image. It's funny that you even frame it as choosing to do this thing, because I think for me, I just had turned to Twitter as this organic way to connect with people. I had just moved to the U.S. for school — I had grown up in Toronto — and I realized I had lost touch with a lot of my comedy friends and a lot of my writer friends in Toronto, and so I'd sort of turned to Twitter because I'd found a lot of people doing really interesting stuff on Twitter. They were writing humor and writing fiction and just sharing interesting pieces and thoughts and aspects of their lives online. And I thought this was such a great space and community to play in. Twitter was the thing that made me understand my mental health better. I had not grown up knowing that therapy was an option for me. I absolutely don't mean to discount any of [Twitter's problems], because that is such a huge issue with Internet culture and just like the social media space in general. I do think, though, that there are pockets of genuine goodness. And I think that's the really hard part to find, is to find those people and to find those communities that are just people trying to connect with each other. Yeah, absolutely ... Twitter was the thing that made me understand my mental health better. I had not grown up knowing that therapy was an option for me. It was only after I got on Twitter and sort of started following a lot of people, and I saw them talking about mental health, really for the first time in an unstigmatized way, and in a way that felt just normal and everyday, and I realized a lot of the stuff is stuff that I feel. And they started talking about therapy, and I thought, maybe this might be something that would help me. And it turns out it did help me. And it turns out that I do suffer from anxiety and depression — and all of that stuff I would not have realized, and I would not have sort of been able to address had it not been for finding these people online that were talking about it. And so I feel like this enormous responsibility to pass that forward in the hopes that it might reach someone else.